I admit that my knowledge of the classic tale of Cyrano De Bergerac was limited to the 1987 Steve Martin movie version, Roxanne, so I had a lot of catching up, or should I say back, to do. 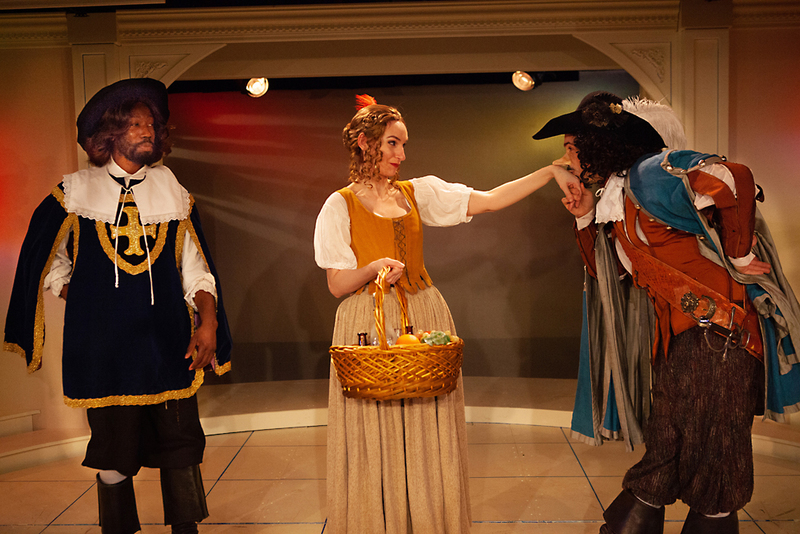 For starters, the 1980s bar fight from Roxanne was actually a lively sword fight in a French theater in the 1640s – which definitely made for much more exquisite costumes on the Swift Creek Mill stage, where Cyrano De Bergerac is is currently showing. The cast of sixteen moved easily across the simply designed set in elaborate and gorgeous period wardrobe, and we were all eagerly awaiting Cyrano’s grand entrance to see how his finest feature would be portrayed. The play moved along at a good pace, and the witty banter kept us engaged throughout the five acts (includes a 15-minute intermission). Cyrano, convinced Roxanne could not fall for him because of his appearance, channeled his unrequited love for Roxanne through the heartfelt letters and serenades he himself crafted but arranged for his handome and tongue-tied friend, Christian, to deliver. While Cyrano’s true love for Roxanne had us hoping she would discover the ruse in time for a happily ever after, Cyrano’s bullish pride was his downfall. Alternately funny, dramatic, witty, touching and tragic, Frankel’s adaptation makes this wonderful story accessible to everyone. With the Franco-Spanish War as the backdrop of much of the play, we get to know many supporting characters in the story, including Roxane’s chaperone, or duenna as it was known in that time, who we were happy to see was portrayed by Swift Creek Mill Theatre regular and fan-favorite Debra Wagoner. We were also pleased to see Travis Williams in the supporting cast, who we know from his great work at Comedy Sportz Improv in Richmond’s West End. Swift Creek Mill and Richmond area stage regular David Janosik nailed the role of Cyrano’s good-looking but dim-witted friend Christian, and the lovely Rachel Rose Gilmour shined as Roxanne in her first performance at the Mill. As it should be, the star of the show was Matt Bloch as Cyrano, also in his first appearance at Swift Creek Mill. A VCU grad, Matt has stayed busy on stages in Richmond and New York City, working with Quill Theatre, Richmond Triangle Players, and Firehouse Theatre, to name a few. Cyrano de Bergerac runs through March 2 on Fridays, Saturdays, select Thursdays, and select Wednesday and Sunday matinees. For tickets for dining and/or theater only, visit Swift Creek Mill. I am becoming a huge fan of the dinner theater concept, what with all of the decisions that don’t have to be made about where to eat beforehand, and all of the driving that doesn’t have to be done to get from one venue to the next (so have that one glass of wine with dinner before the show starts!). A dinner theater makes for a perfect date night or friends’ night out, and my trio certainly enjoyed our opening weekend visit to Swift Creek Mill Theatre for a gals’ dinner and Cyrano de Bergerac. The dining room was packed with patrons of all type – date nights for the young, old, and in between, multi-generational family outings, and ladies’ nights. Our waitress, Susan, who has been serving at the Mill for an admirable twenty-five years, was a delight, and it was clear that she truly cared about whether we enjoyed the food, drinks, and service (yes on all counts, and here’s a tip – get the crêpes suzette for dessert!). Special date night package! $100 for two tickets, dinner for two, and two glasses of sparkling wine – call 748-5203 to reserve or book online here.